I checked, the last submission was October 30th, and I had intentions of being back real soon. Two weeks after that I got very sick. For three months I did next to nothing and certainly did not work on Tiny Kitty or the blog. Turns out all those things I thought were allergies, were not. After testing, it seems I am allergic to anything, and I have asthma. So, after some aggressive treatment to get my bronchitis all better, am now on a daily regimen that has be all happy and working again. Once well, and I am well, and a 100%, I began to get back on track. 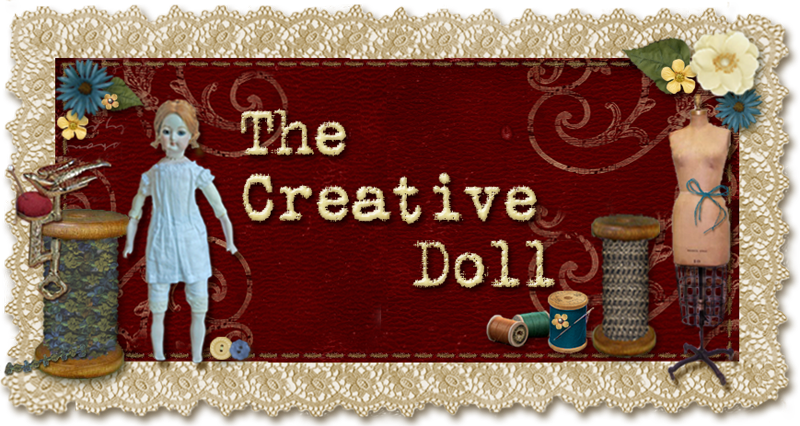 I have completed a few projects and intend to share in the days and months to come as I am really proud of the work I did on the dolls. And I am really glad to be working to see if I can finish this Edwardian day dress for Tiny Kitty. Little by little I catch up to where I feel comfortable and not pressured to deliver things on a deadline. A little recap, please. 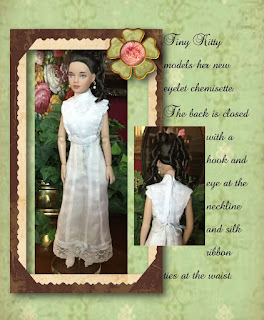 Tiny Kitty is a Tonner, Inc. doll, and is 10”. My Kitty came to me via the convention souvenir of the UFDC convention in Washington, D.C. in 2013. The theme was “A Capitol Affair”. This doll came packaged beautifully in her flip top box with a peignoir on the left and a fan and she was dressed as Mrs. Helen Taft in her inaugural gown of 1909. The gown was exquisitely presented with gloves and heels and jewels. She is a pretty doll of 10”. She is jointed, I would not say fully ball jointed, but she has some positioning ability. The inspiration illustration of the dress shows a drawing of a dress over a chemisette which appeared to be either a delicate print or an eyelet. Researching the period I found a chemisette of the period and used that as an example. 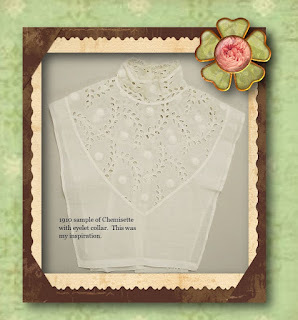 I have a beautiful 100% cotton eyelet fabric from Urban Gardens Fabrics, that has a small scale embroidery. I chose to use it for the chemisette. Also, I didn’t want to use anything that appeared too contemporary in a print. 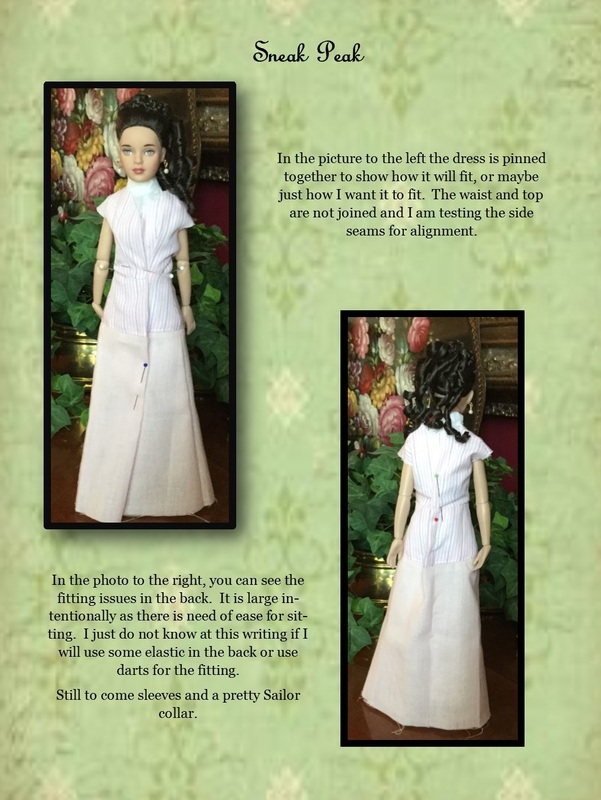 Now that the chemisette is complete, I can continue with the dress. I have added a sneak peak of her fitting for her dress. I hope you enjoy.